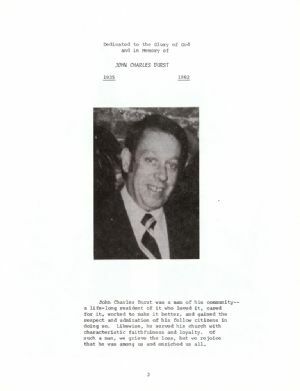 John Charles Durst was a man of his community— a life-long resident of it who loved it, cared for it, worked to make it better, and gained the respect and admiration of his fellow citizens in doing so. Likewise, he served his church with characteristic faithfulness and loyalty. Of such a man, we grieve the loss, but we rejoice that he was among us and enriched us all.